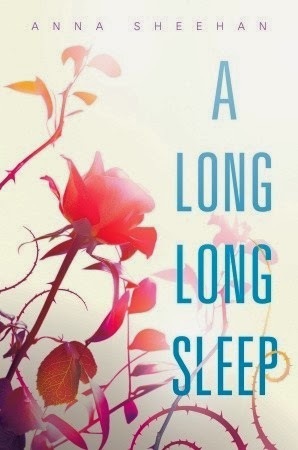 The fact that this was a retelling and that it was set in a futuristic society dealing with Sleeping Beauty after she woke up made the appeal factor go way up. Add in the positive reviews from other bloggers and I was already searching for it in my library system. I bypassed my other waiting-to-be-read library books and went straight to this one, anticipating the greatness. What did I receive in return? Rose. If I can't like or connect with the main character, the rest of the book is almost hopeless. I say almost because I still kept reading. I thought Rose was weird, not because she was the futuristic Sleeping Beauty, but because her character felt forced and I found myself grimacing too many times at what she was thinking or saying. Besides weird, she was also way too naive and her narrative was boring. Weird, naive, and boring are not adjectives that I like in my character. Relationship with Xavier. So we have weird Rose and her unstable childhood, because her parents decided to make her unconscious for months at a time, and now we add in a boy. We're given flashbacks to before her long stass period and we meet Xavier. But Xavier is special. Why? SHE CHANGED HIS DIAPERS. That's right. She was seven years old when he was born and changed his diapers. As her parents continued to stass her, he grew up. They eventually reached the same age when they became teenagers and fell in love. Gross. Of course, since her parents stassed her even before she was seven, she realizes that she's old enough to be his mother and still continues the relationship. Ew. Relationship (?) with Bren. She goes on about her love for Xavier all throughout the book, but early on, she starts to think that she's falling in love with Bren, the boy who woke her up, and this is not a spoiler. Considering that he only did the casual niceties that a boy does to a weird girl after she's slept for a long time, I thought it was odd that she jumped right to love. Whoa there, Rose. She asks him out, he says no, and she goes crazy and heartbroken. I, on the other hand, felt no sympathy and my eyes started to hurt from the eye-rolling. MORE WEIRDNESS. I hated all the weirdness, but that's what this book seemed to be made out of. Rose, her relationships, and then her friendship with Otto. I really hoped to like Otto, but what he said and Rose described him to be was one thing, but his actions were completely another. Unfortunately, I can't say more than that. The ending. It ends with a very rushed epilogue that made me roll my eyes for the millionth time, but then I see on Goodreads that this "standalone" will have a "standalone sequel." That's right. They call both of them a standalone. A standalone sequel...really? The epilogue was completely unnecessary because it didn't give us a glimpse into anything else. It was her narrative of boringness. We discover something significant about her, but then it's pushed aside as an afterthought in the end. I wanted to know the answers to all the open questions, but I doubt I'll be picking up the sequel. Blah, blah, blah. More weirdness. Blah, blah, blah. WEIRD. "That's okay," I said. "If you can make friends now, you'll be able to make friends later." "Did you make friends?" she asked. "Like I said. I'm not really the one to ask." Rose, all she was asking is if you made friends. You ARE the person to ask and the answer is NO (unless you count Otto and Bren). "I know you will. I know you will." He covered my face with kisses until my knees buckled and I melted in his arms. "I'll miss you!" he hissed. "Oh, hell!" And he gripped me tight enough to bruise. "It's not fair!" Their whole relationship/romance acted like a fail. Also, why are you letting him grip you until bruising?! I know several people who loved this book. My bloggy friend Alice listed this as one of her favorite reads of this year. So you might like it. For me, I'm amazed that I didn't DNF it. Verdict: Boring, weird, and gross all wrapped up into a possible DNF. Oh, that's sad that you didn't like it. It sounded like it had the potential to be really good. And it sounds like the things that you didn't like are the things that would bother me, too. :( If I can't like the main character in some way, I just can't finish the book. And Problem #2? Ewww! That's just gross. I was pretty disappointed that I didn't like it as much as I hoped. That's what I'm saying! Just wrong. Aww oh no I just bought this one :( Hopefully I'll like it a little bit more than you did. A+ gif usage ;) Yikes, this one sounds pretty bad. I was really excited for it, too-I love retellings. But the problems you pointed out would bother me too so I will for sure be skipping out on this one. The relationship issues you mentioned make me want to cringe and I haven't even read the book, I hate when the MC can't decide like that. Thanks ;) It was super disappointing. So many things add up into a catastrophe. Oh wow haha I was actually laughing at those quotes! They sounded so superficial I used to think I kinda wanted to read this book but reading your thoughts now...I don't think I'll read it now. XD but I had a lovely time reading your rants about this book. It was nice to know to stay clear of this weird book. Well, this book seems weird. And not in a good way. I'm all for unique, and I don't even care if the main character is likable, but the points you raise are making me raise my eyebrows and want to run away. The relationship situation sounds particularly bad; I could never get over the awkwardness of dating a boy whose diapers I had changed. Sorry you didn't like this one and thanks for letting me know I should stay away! It was just too odd for me. I hated cringing so much. Oh, wow, Sunny...this sounds bad. Make that terrible! What happened? I'd heard good things about this, too, and I wanted to read it, but after your review, I don't think I can. Unless it's just to experience all that weirdness, lol. That whole being old enough to be his mother thing, though...that might be a deal breaker. Gross. Stop! In the Name of Love...please.